For Zoe Hickel, the NWHL came into existence at the perfect time, as she had just graduated from and completed four excellent seasons with the University of Minnesota-Duluth. Hickel hails from Anchorage, Alaska — and she and fellow Alaskan, teammate Jordan Smelker, are Isobel Cup champions. 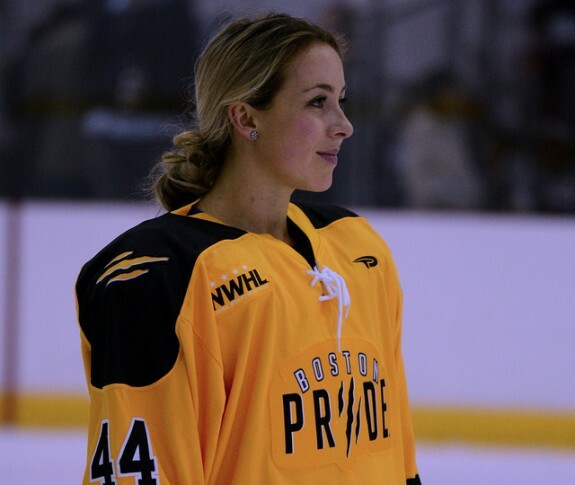 She was the first US National Team member to sign with the Boston Pride/NWHL and came into the league on quite the high after winning the gold medal in 2015 at the Women’s World Championship. Boston’s roster is overflowing with talent, so it was understandable that Hickel chipped in just seven points (3g-4a) in 17 regular season games as she found her way. But once the playoffs started she really found a groove and put up four points (1g-3a) over four games helping the Pride to clinch the first-ever Isobel Cup; she could have had five points if not for that goalpost that got in the way during Game 1 vs. Buffalo. Hickel will turn 24-years-old this summer and should be part of what looks to be a possible dynastic team in Boston, who just reeled off 11 straight wins to end the season and lost only four times (once past regulation) all season. Usually we conduct our interviews off the ice, but following the Pride’s 3-1 Isobel Cup-clinching victory over the Buffalo Beauts in Game 2, The Hockey Writers spoke with Zoe Hickel on the ice minutes after celebrating with her teammates to get some insight on the series, the Boston swagger and making history. The Hockey Writers: What’s going through your mind as the time runs off the clock at the end of this game? Zoe Hickel: Honestly, Buffalo’s a great team and they gave us a hard battle; we knew that they were going to battle us to the end. We just knew we had to keep it simple and play our game – not worry about getting too far ahead of ourselves. Just win every battle and win every shift. THW: These last two games were very close; were they the toughest challenge you’ve had all season? ZH: We knew that whatever happened last weekend we were going to be facing the best possible team. (For us) it’s just bringing our game and not worrying too much about the other team, but you know you’re going to get their best and we have to bring our best. That’s what we just kept trying to focus on. THW: A year ago at this time the NWHL didn’t exist; what if I told you that you were going to be a paid professional hockey player back then, and that you were going to be a champion? You would’ve said I was crazy right? ZH: I know, it’s an unbelievable feeling (smiles). The best thing is, this team has been so much fun and I’m just so proud to be a part of it. It was a great first season out of college and into this professional league. Hopefully it just keeps going up from here. THW: On that Cup, all of your names are going to be on it; and every team that wins it from here on out is going to see all of your names there as the first ones to win it. Does that have a special meaning to you, or a make this moment more special than it already is? ZH: Absolutely. History begins. That’s been the theme throughout this whole year. All we can do is just keep aspiring to inspire more generations to come and just keep taking the game to the next level. It’s just…amazing to be a part of. THW: Anyone who’s watched this team this season definitely notices the confidence and swagger that this team plays with. It also seems like you all have a lot of fun together on and off the ice; what fuels this team? ZH: We’re fueled from ourselves. Our team is so good in that – everyone gets along, we’re all supporting of each other and everyone brings a special thing to this team. We’re at the age, and at that level, where we can appreciate all that and it comes together so nicely. To be able to win at the end of the season, and finish so strong is just an unbelievable feeling. Our team just has so much fun together. It keeps everyone loose and it keeps everyone playing their best; I think that’s what you see. That’s probably it (laughs). THW: I know it just happened a few minutes ago, but have you thought about what you want to do on your day with the Cup? ZH: No (grinning widely), someone else just asked me…I don’t know what I’m going to do (yet). I’m sure it’ll be fun…but were going to bring it back to Denna (Laing) first. That’s first things first, from there …I’ll just go with the flow.